Beginning with a survey of fundamental concepts associated with data integration, knowledge representation, and hypothesis generation from heterogeneous data sets, Methods in Biomedical Informatics provides a practical survey of methodologies used in biological, clinical, and public health contexts. These concepts provide the foundation for more advanced topics like information retrieval, natural language processing, Bayesian modeling, and learning classifier systems. The survey of topics then concludes with an exposition of essential methods associated with engineering, personalized medicine, and linking of genomic and clinical data. 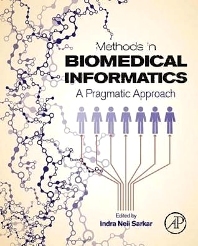 Within an overall context of the scientific method, Methods in Biomedical Informatics provides a practical coverage of topics that is specifically designed for: (1) domain experts seeking an understanding of biomedical informatics approaches for addressing specific methodological needs; or (2) biomedical informaticians seeking an approachable overview of methodologies that can be used in scenarios germane to biomedical research. Material is presented as a balance between foundational coverage of core topics in biomedical informatics with practical "in-the-trenches" scenarios. Contains appendices that function as primers on: (1) Unix; (2) Ruby; (3) Databases; and (4) Web Services. Biomedical informaticians seeking methods that can be used in on-going research, and biological and medical practitioners seeking biomedical informatics approaches to address specific needs. 3.4 What Does a Representation Mean? Director of Biomedical Informatics and Assistant Professor in Microbiology and Molecular Genetics (with a Secondary Appointment in Computer Science) at the University of Vermont, Burlington, Vermont.